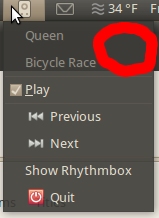 Could the rhythmbox panel indicator pull in cover art from the currently playing song? you mean in the menu? would it make any sense to have a 16 pixel cover displayed? I was thinking to display with you click on the indicator next to the song name and artist. Could fix a 48x48 pix there. Yes, that would require something like custom menu item layouts. Setting to triaged, since this is an Ubuntu specific wishlist and the bug has all the information required. The original taskbar icon showed a ballon with the album art en song progress. The applet menu's already display icons. can't that be used?